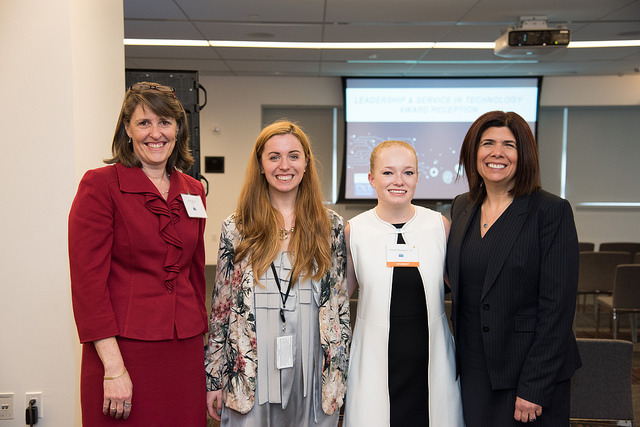 The fall semester may be coming to an end but the Seidenberg Tech Leadership Series is showing no sign of slowing down! Events are already being scheduled for the spring, but for the tail end of the fall semester we had a fantastic guest: Daniel Barchi, SEM, SVP, and CIO of Newyork-Presbyterian. Over the course of his career, Daniel has taken on the role of Chief Information Officer for numerous health care systems: Carilion Health System, Yale New Haven Health System, Yale School of Medicine, and currently New York-Presbyterian Hospital. Before taking on these high level positions, Barchi acted as a Naval Officer in the US Navy for six years. He was even awarded the Navy Commendation Medal for his leadership. 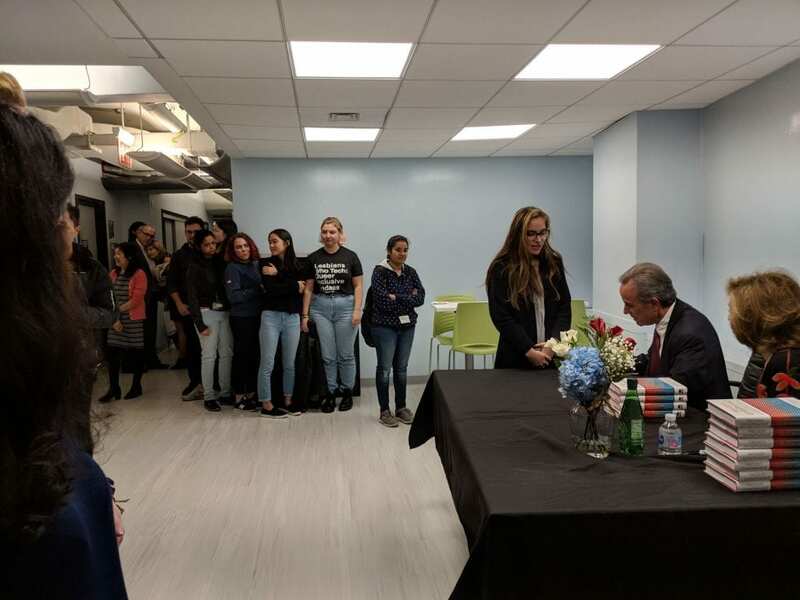 Testament to Daniel’s career and expertise was a great turnout of students who came to the Seidenberg School’s NYC campus the day before finals week. Despite escalating stress levels, around a hundred students stopped by to learn from our guest. 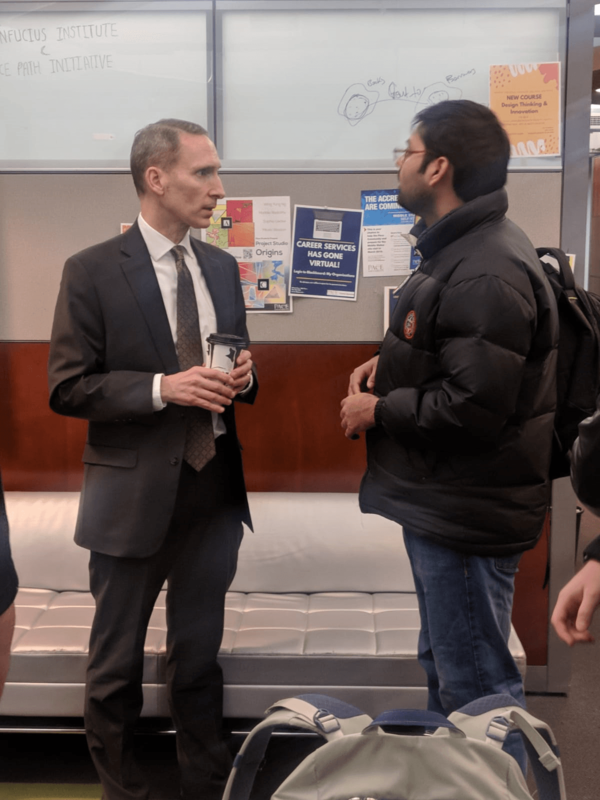 As with previous events, Daniel spent around an hour talking tech and leadership in conversation with Seidenberg Dean Jonathan Hill. 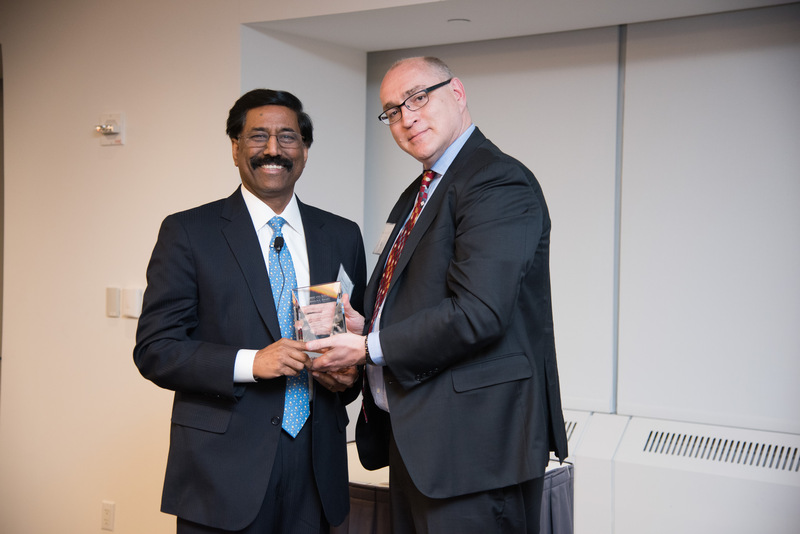 Dean Hill quizzed the CIO about various aspects of his work, including the importance of technology in the healthcare industry, strategy, telemedicine and remote healthcare, and more. “That 5% technology is important,” Daniel added, telling a story of how just that morning there had been a tech blackout in one of the locations his department serves. Despite technology just being a small part of the entire ecosystem, if that 5% goes down, the whole system fails – which is why Daniel and his staff work hard to get everything back up and running as quickly as possible. The people and process enable responses like that to happen. As users, we tend to just care about the parts we interact with. “Everybody is focused on that 5% that’s above the surface,” Daniel said. Maintaining the larger 95% is what allows users to interact with systems without worry. Dean Hill then asked about Daniel’s technology strategy. Part of the strategy is also developing new tech advancements. Daniel spoke at length about the cool things Newyork-Presbyterian was doing for medical staff and patients alike, including telemedicine initiatives like having physicians interact with patients over video calls and asking questions that got them to self-diagnose and allow the doctor to give treatment without being there in person. Did he think computers would replace the need for human doctors entirely? “We think that the physician or nurse PLUS the computer is better.” Although artificial intelligence is getting to the stage where using computers to diagnose and treat medical issues is becoming more and more possible, the nuance of the human mind is a crucial aspect to identifying and understanding the small distinctions that differentiate between similarly presenting issues. “What should these students be doing to prepare themselves for a career in this area,” Dean Hill asked. 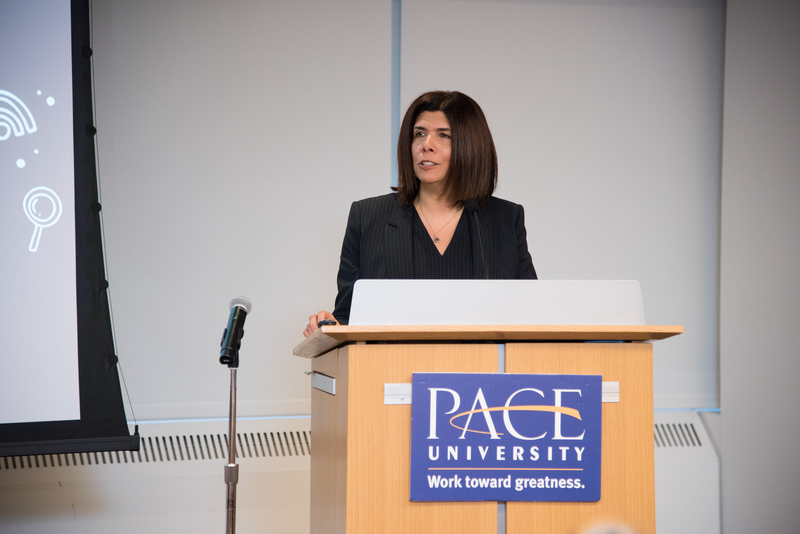 At the Seidenberg School and at Pace University, we always encourage our students to diversify what they learn. Knowing more than one area, and learning how to apply skills from one field into another, is what helps get jobs across different areas. Daniel affirmed that this was key to working in the tech sector today. One area that is expected to remain current for the foreseeable future is cybersecurity. Daniel revealed that on the past weekend he had been in a long phone call when a hacker had attempted to penetrate their system with a version of the Wannacry virus – seven attempts in all – but the team managed to take care of it. As users, we choose what we put online, whether it’s vacation location tagging on social media (that indicates our homes are currently empty) or our personal information on banking websites, investment accounts, and more. “We can all make choices to make ourselves safer,” Daniel remarked. But the truth is that the more we engage with the internet the more we put ourselves at risk. Sharing one of his favorite quotes, Daniel illustrated his point. We’d like to thank Daniel Barchi for his stellar appearance at the Seidenberg School of Computer Science and Information Systems at Pace University. The Seidenberg Tech Leadership series is one of our top event series that puts our students in front of exceptional leaders in the industry, and Daniel’s genial presence was perfect for bringing calm before the end of the semester. 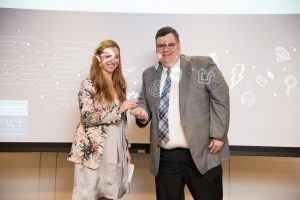 This year marks 35 years of the Seidenberg School of Computer Science and Information Systems being an independent school at Pace University. Originally called the School of Computer Science and Information Systems, the school gained the Seidenberg name in 2005, when Ivan Seidenberg made a record-breaking donation to Pace University in support of his strong belief that all students should receive a tech education. The Seidenberg School is celebrating its 35th year as an independent arm of Pace University. It’s only natural that, now, whenever Mr. Seidenberg stops by his namesake school, there’s a hint of celebrity in the air. As a top executive for much of his career, Ivan already cuts an impressive figure. 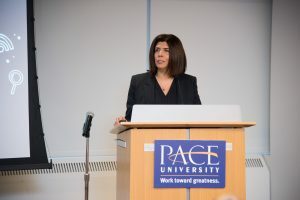 However, his 2005 gift to Pace University has been hugely significant for many of our students, enabling them to attend the Seidenberg School as part of the Seidenberg Scholars program – so there is also a sense of gratitude among the excited whispers that there’s a famous celeb at Pace. So it was no surprise that on Thursday, November 8, 2018, the Seidenberg Lounge at 163 William Street was packed. 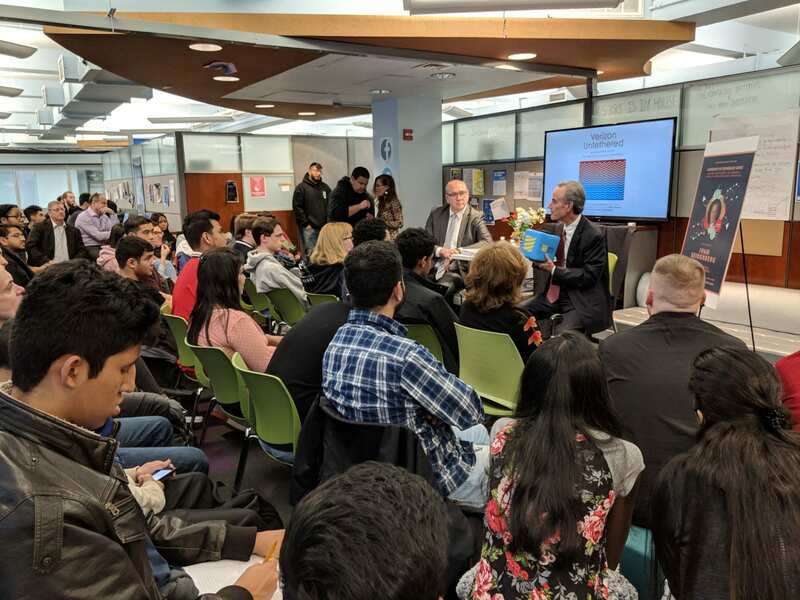 Students, faculty, and staff turned up in force to meet and hear Ivan speak about his fascinating career, his leadership, and his advice for the next generation of technology executives. 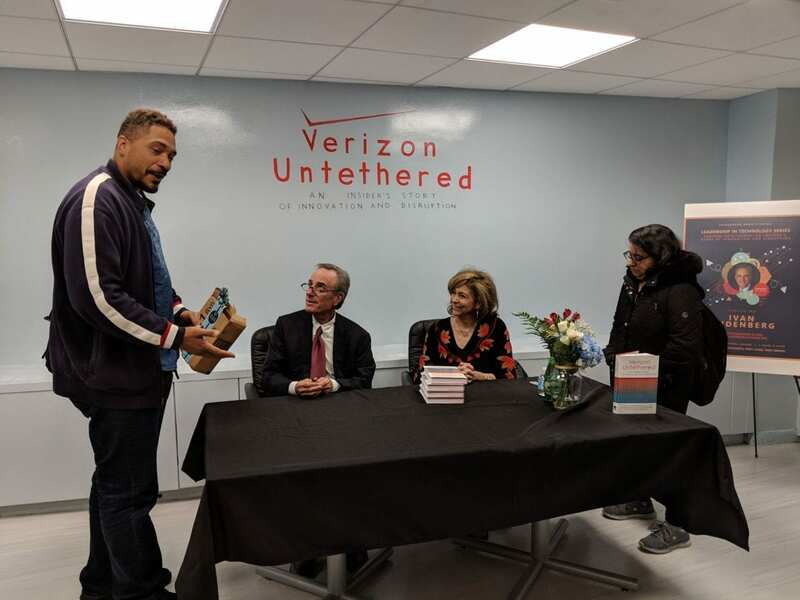 Not only was Mr. Seidenberg on campus to share his wisdom with the community, but we had a crate of volumes of his new book, Verizon Untethered: An Insider’s Story of Innovation and Disruption ready to be signed and shared with our students. 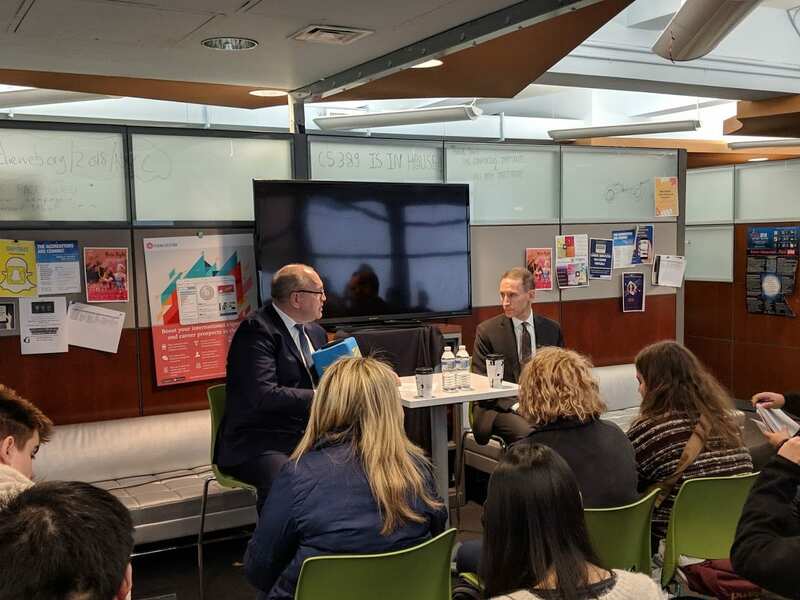 Our guest sat down with Jonathan Hill, Dean of the Seidenberg School, for a fascinating conversation before an audience that was bursting at the seams. 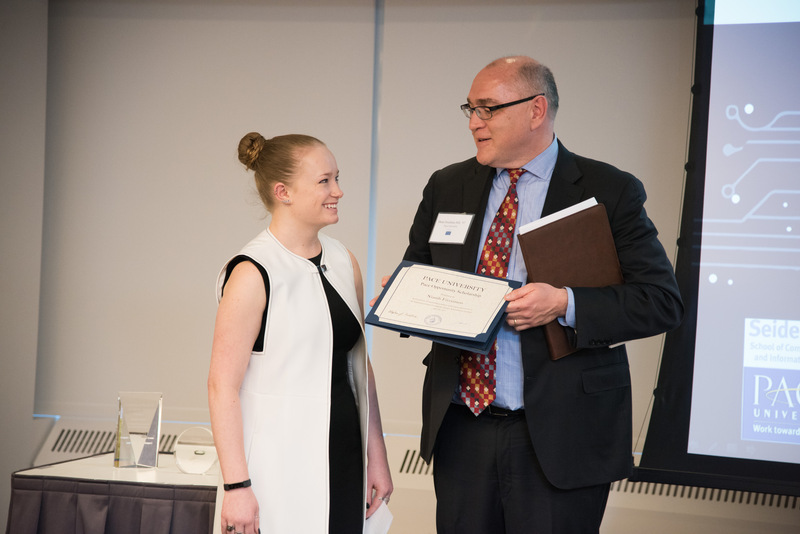 After the introductions, the pair cut swiftly to the chase with Dean Hill’s first question – what can our students do to succeed in the workplace? “It’s okay to win, and it’s okay to fail,” he added, noting that he had always found that the harder the work was, the more engaged he got and the more engaged the people around him became. Dean Jonathan Hill and Ivan Seidenberg kick off the discussion before a packed audience. Leading by serving the needs of others may sound counter-intuitive, but it’s an effective technique. “How do you deal with crises?” was Dean Hill’s next question. Ivan responded with a story. He explained about how, when he retired in 2011, lots of people told him he should write a book. After thinking about it and deciding he’d like to give it a try, he spent a lot of time talking to people who influenced his life and his career, and listening to their stories. Those stories became the chapters of his book. “It’s an example of how the power of more than one creates a story,” he remarked. He was then asked to define what a ‘win’ meant for him. 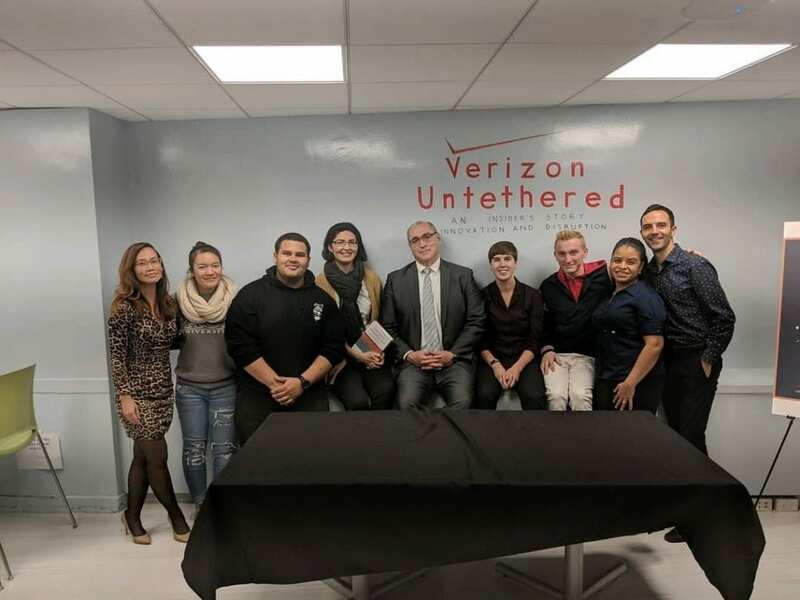 “A win wasn’t necessarily more money, it was having a higher purpose,” he said, and continued with an example from his time at Verizon. Verizon wanted to provide unlimited bandwidth to its customers but was constrained by the capabilities at the time. The company still wanted to do something good for its customers, so they shifted perspective and came up with the goal of becoming the ‘best network’. Once they agreed on their higher purpose, they were able to start acting to make it happen. It was a good time for Dean Hill’s next question: what are you most proud of? 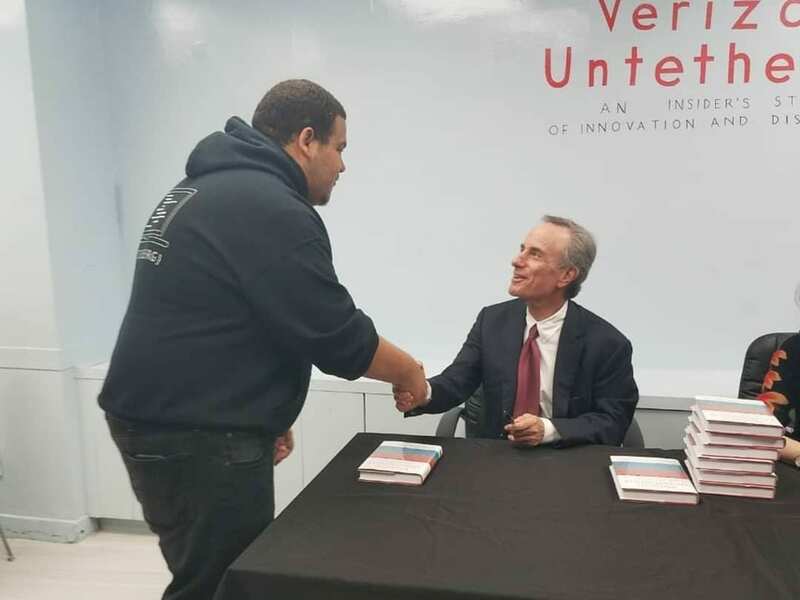 There was a long line of students to meet Mr. Seidenberg and have their copies of his book autographed. As time was trickling away too quickly, the Dean turned to the audience for questions. Here are a few of them with Ivan’s responses. Q: If you were a college graduate today, would you pursue the same career or something different? A: I’m only going tell you this cos you shouldn’t do what I did . . . I ended up leaving day school and going to night school. I ended up in the army because of that. I ended up overseas, somewhere I didn’t want to be, because I dropped out of day school. Then I ended up working at the phone company because I dropped out of day school . . . obviously it worked out! But I realized that over that time that I had to fit in, that I couldn’t be an outcast. I had to realize that the sun and the moon and the starts didn’t revolve around me. Sound familiar? What I would not change is the lessons I learned and how I applied them. But whether they would lead me down the same career could be different. Q: What big risks did you take? A: I came home and told my wife “we’re moving to Washington!” . . . that was the hardest sale I’ve ever had to make! The other one was when I chose to give up my job as CEO and become co-CEO. Most of the risks you take are personal. They’re not business risks. Following the Q&A session, the event moved to the renovated collaboration space where a table had been set up for the book signing. Students lined all the way down the hallway for their chance to meet and shake hands with the Seidenberg School’s benefactor. 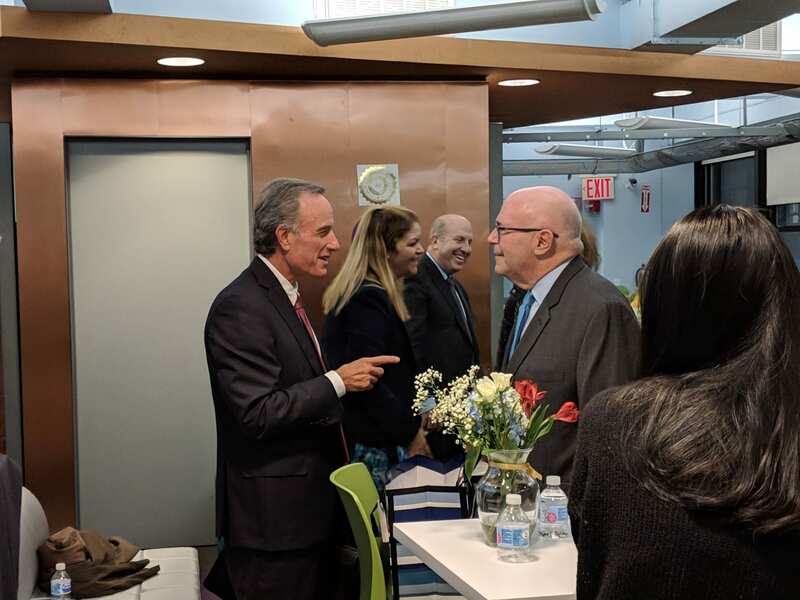 A small celebration took place as the Seidenberg community thanked Mr. Seidenberg for the visit and for his honesty and depth during the discussion. 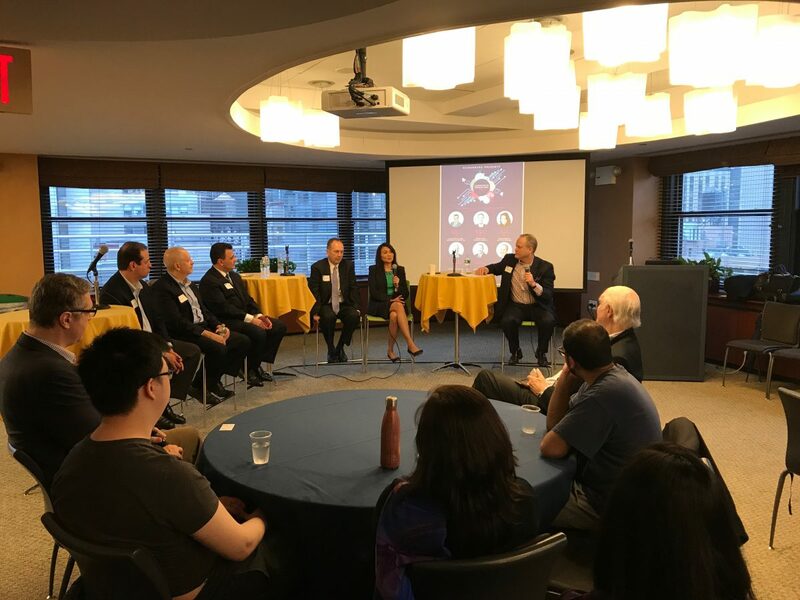 Pace University President Marvin Krislov and Provost Vanya Quiñones also stopped by to greet our guest, and we were happy to see quite a few alumni return to their old stomping grounds for the occasion. 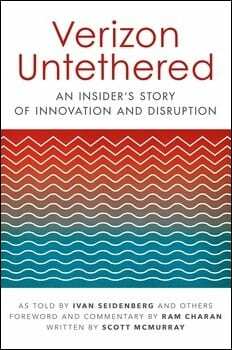 Ivan Seidenberg’s book, Verizon Untethered: An Insider’s Story of Innovation and Disruption, is well worth the read for any aspiring leader who wants to learn from one of the best. We’d like to thank Mr. Seidenberg and his wife Phyllis for their time and generosity throughout this event. Students gave the most positive reviews and we hope to have you back in 2019! 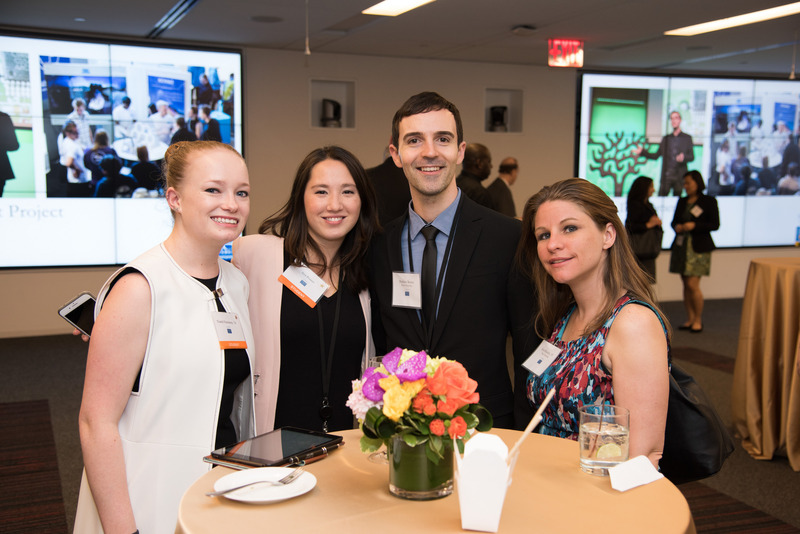 Team Seidenberg – the students and staff who make it happen! 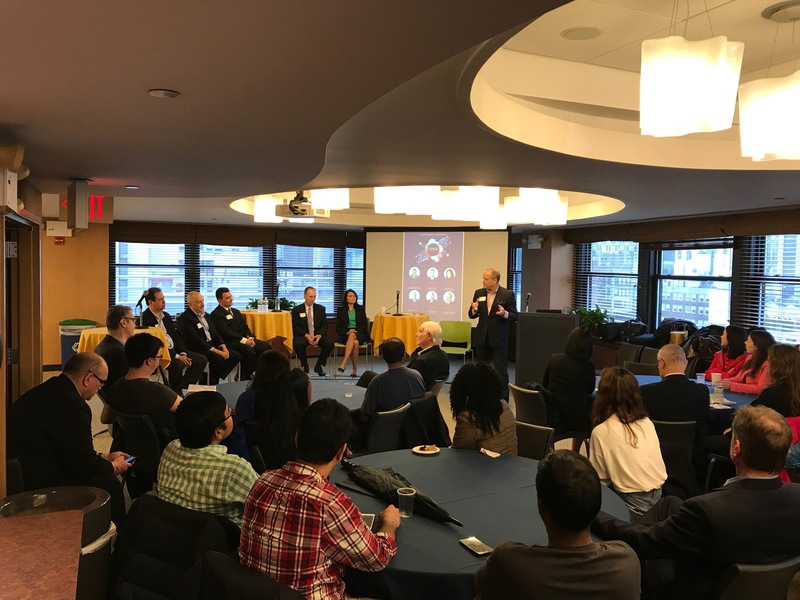 The Seidenberg School of Computer Science and Information Systems at Pace University welcomed a guest to the Tech Leadership Series for a discussion with Seidenberg students. 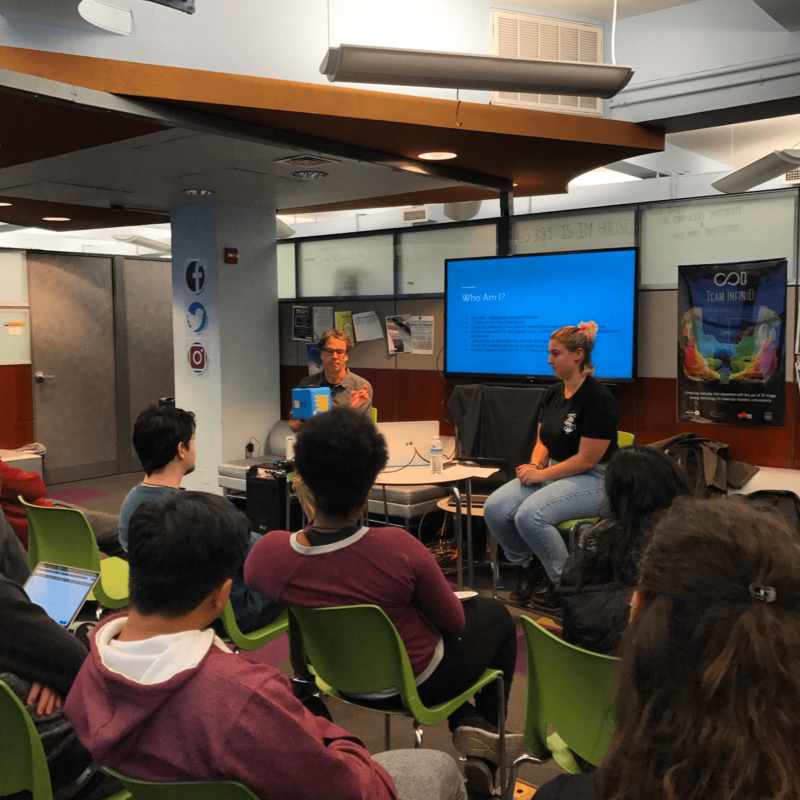 On Thursday, October 25, the Software and Systems Engineer at AJA Video Systems, Inc., Jeff Coffin, spoke on the New York City campus for a discussion on the topic, “Embedded Linux: What the Heck is it?” Students had the opportunity to dive into what an embedded system is all about with Jeff. 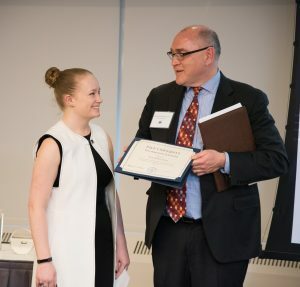 The talk took the form of an interview, where Jeff was posed questions by a very special Seidenberg student – Charlotte Coffin, aka his daughter! Jeff, current AJA Software and Systems Engineer as well as former American Airlines Software and Systems Engineer, specializes in the operating system known as Linux. The operating system runs most devices that people use every day along with running most of the internet. 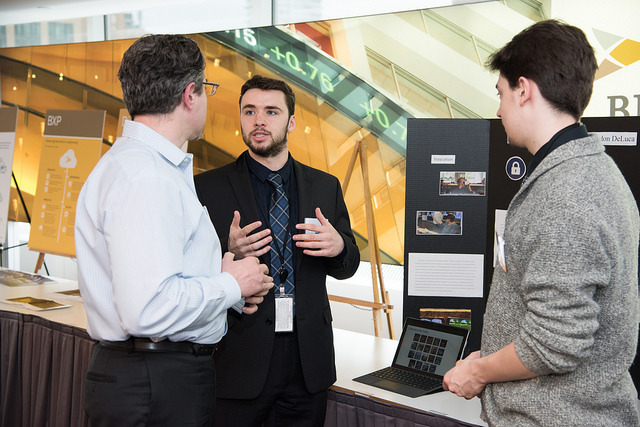 With an industry professional who has vast knowledge of such an integrative piece of technology, it gave students an opportunity to use critical and creative thinking skills. Students also received the opportunity to speak with Jeff about his many years of experience in the technology industry. 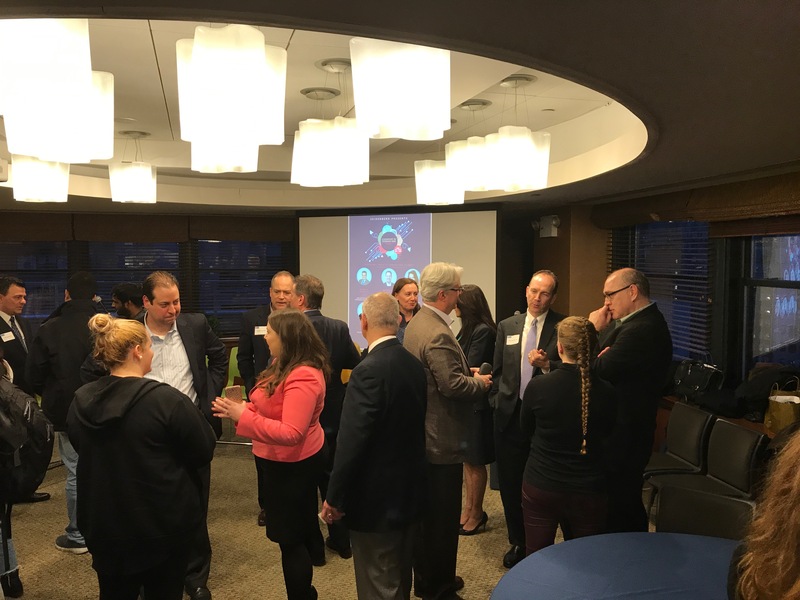 Networking also occurred at this event located in the Seidenberg lounge. If you missed out on this event, no worries! We have many more speakers lined up for the rest of the Leadership in Technology series. Wednesday, Nov. 14, the Westchester campus is hosting another segment of the leadership series starting at 12:00pm at the Seidenberg Lounge in Goldstein Academic Center. Special guest, Peggy Yao, will be a speaker at Seidenberg Tech Collective’s lunch and learn. 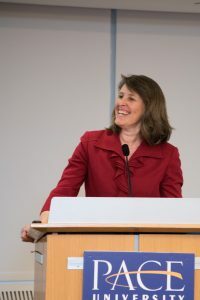 Her speech will be dedicated to the topic, “Mindfulness for Professional & Personal Success,” a topic not often associated with the technology industry. Students will be able to learn tips for a more mindful outlook, network with Yao, and free lunch is, as always, provided. RSVP here to attend. The next event in the series will be on Nov. 28 at the Westchester campus at the Seidenberg Lounge at 12:00pm. Merin Joseph will be giving insider experience from her position as Executive Vice President and Chief Information Officer at WESTMED Practice Partners and WESTMED Medical Group. Students can attend this event to get networking experience and tips on how to succeed in their chosen fields. RSVP here to attend. The last event in the series will be on Dec. 12 on the New York City campus at the Seidenberg lounge at 12:00pm. The last series speaker, Daniel Barchi, will be giving the inside scoop on his career goals and experiences as Chief Information Officer of NewYork-Presbyterian. Students can join in on this final event to get networking experience and tips on how to succeed in their chosen fields. RSVP here to attend. We hope to see you at these events for the Seidenberg Technology Leadership series! 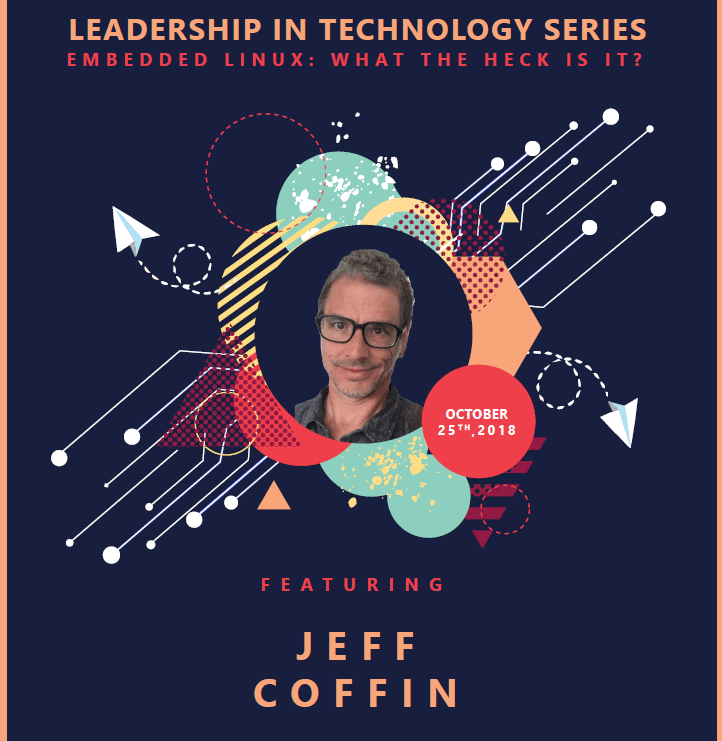 The Seidenberg School of Computer Science and Information Systems at Pace University is welcoming a very special guest speaker to the Leadership in Technology Series, so get ready to mark your calendars. 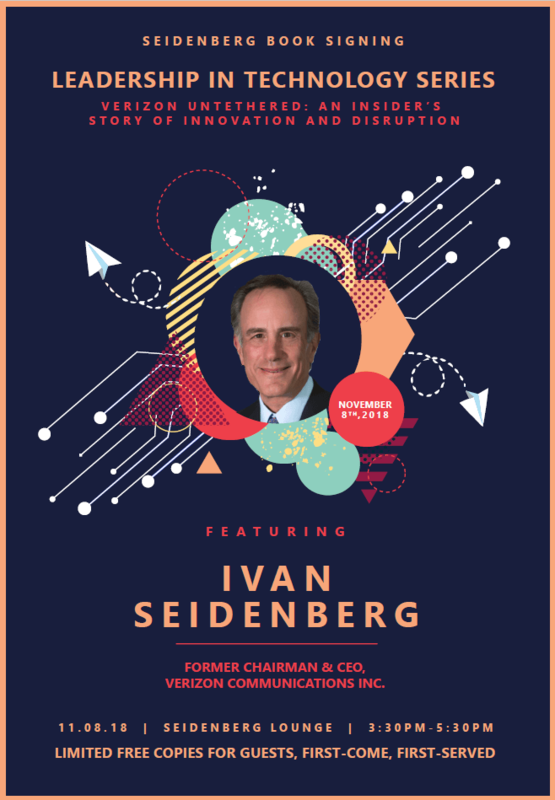 On Thursday, November 8, the former chairman and CEO of Verizon Communications Inc., Ivan Seidenberg, is coming to the Seidenberg lounge for an exclusive discussion on his book, Verizon Untethered: An Insider’s Story of Innovation and Disruption. We are thrilled to have Mr. Seidenberg back on campus and can’t wait for our students to have the chance to meet one of the people who has had the biggest impact on our School and our community. A limited number of free copies of the book will be available on a first come, first served basis. Seidenberg, an alumnus of the school, attained his Master’s Degree in Business Administration and Marketing at Pace University. After receiving his graduate degree at the university, Seidenberg went on to create his career at Verizon. The now former Telecommunications Executive made his way up to the role of CEO and became an industry leader in his field. 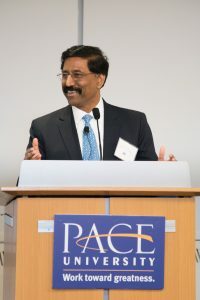 The Seidenberg School of Computer Science and Information Systems was named in honor of Ivan Seidenberg after he donated the largest gift ever received by Pace University at the time in 2006. The $15 million donation from the industry leader was used to build and expand our School, branding it as the Ivan G. Seidenberg School of Computer Science and Information Systems. Today, the Seidenberg School is the largest it has ever been and it continues to grow in enrollment every year. 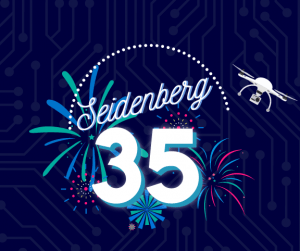 This event comes at the perfect time as the Seidenberg School is celebrating its 35th anniversary this year. 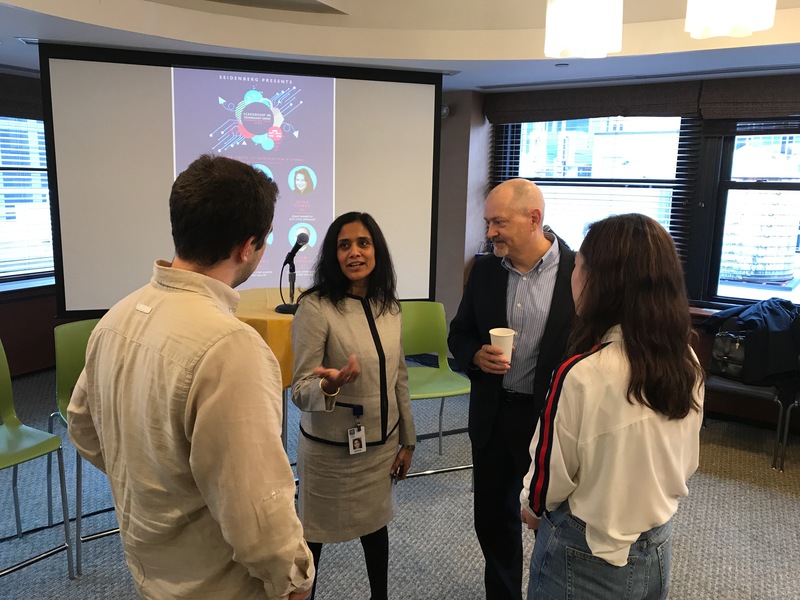 At the event Seidenberg will talk about his book, experience at Verizon Communications Inc., and his time spent at the University. This will also be the perfect time for students ask Seidenberg questions about his very own Pace Path and how it assisted him in his own career. The event will take place at 3:30pm on the second floor at 163 William Street. Seidenberg’s book on his experience at Verizon will be available for the first guests who come to attend this one-time event. Students will have the opportunity to network and chat with the face of the Seidenberg school as well. RSVP here to confirm your attendance. We hope to see you next Thursday afternoon at 3:30pm! Arrive early for a chance to secure a free copy of Verizon Untethered!